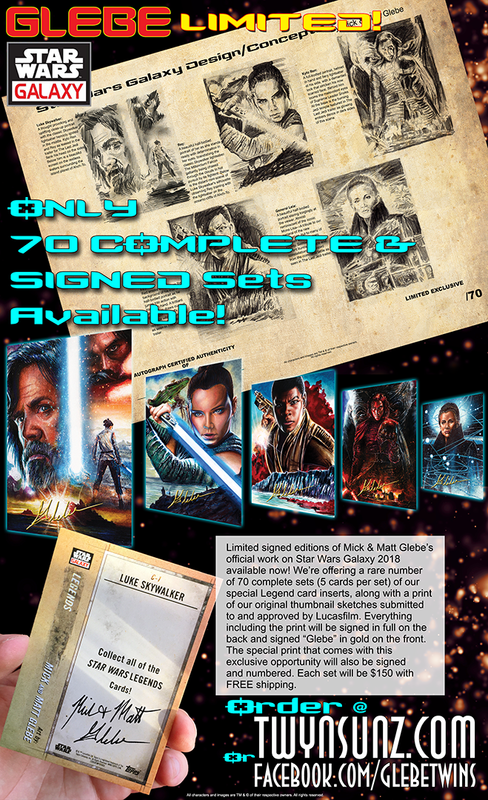 Limited signed editions of Mick & Matt Glebe’s official work on Star Wars Galaxy 2018 available now! We’re offering a rare number of 70 complete sets (5 cards per set) of our special Legend card inserts, along with a print of our original thumbnail sketches submitted to and approved by Lucasfilm. Everything including the print will be signed in full on the back and signed “Glebe” in gold on the front. The special print that comes with this exclusive opportunity will also be signed and numbered. Each set will be $150 with FREE shipping within the US.